Tim Hortons has won a major legal battle against franchise owners, now that a judge has tossed out a proposed $2-billion class-action lawsuit over the price of doughnuts. Tim Hortons franchisees benefit from an iconic national brand, and with such high profits from coffee sales, they should accept lower margins on food, according to the decision by Justice George Strathy of Ontario Superior Court. Tim Hortons has won a major legal battle against franchise owners, now that a judge has tossed out a proposed $2-billion class-action lawsuit over the price of doughnuts. 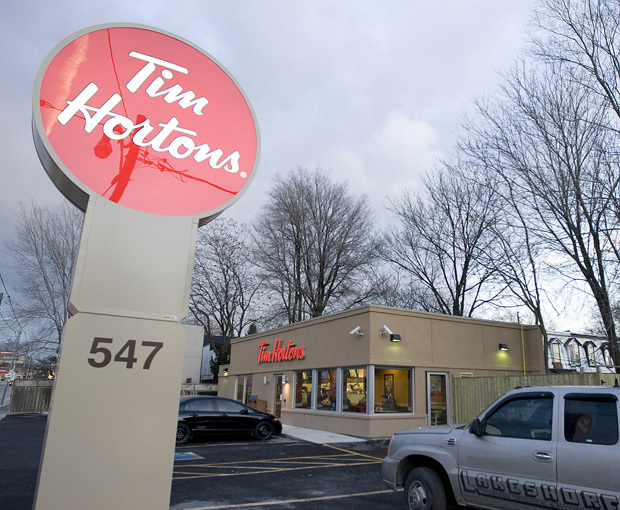 Tim Hortons franchisees benefit from an iconic national brand, and with such high profits from coffee sales, they should accept lower margins on food, according to the decision by Justice George Strathy of Ontario Superior Court. “The fact of the matter is that under the Tim Hortons system, the franchisees are given the licence to sell Tim Hortons trademarked coffee — a brand that is about as iconic as there is in Canada,” the judge wrote. At the heart of the case, which began in 2008, is what the judge describes as the “Always Fresh Conversion,” a shift from fresh baking in each store to a system of industrial par baking and flash freezing at a centralized plant in Brantford, Ont., followed by reheating in specially designed ovens. To say this shift was controversial is an understatement, like saying Canadians are fond of Tim Hortons. The truth is they are patriotically loyal to it, and the switch to frozen doughnuts and muffins was seen as a major corporate risk, and it was the subject of intensive consultation with franchisees. Until 2002, baked goods were made in store by trained bakers, using ingredients supplied by Tim Hortons, which gave each franchise a signature fresh-baked smell, but could be inefficient, inflexible and expensive. In 2010, Tim Hortons sold its half of this industrial bakery to Aryzta AG, the Swiss company that already owned the other half. Co-founder Ron Joyce, who has since left the company, was especially critical of the switch to frozen, and the ensuing legal battle came to be seen as an almost tribal conflict between those loyal to Mr. Joyce, and those loyal to his successor, Paul D. House. The lawsuit, intended as a class action on behalf of all franchisees, was doomed to fail from the beginning because it is not the court’s role to rewrite valid contracts, Judge Strathy wrote in his 140-page ruling. The case was brought by Brule Foods, which runs two Tim Hortons in Ontario, and is owned by Archibald Jollymore, a cousin of Mr. Joyce and his former executive vice-president. The other plaintiff is Fairview Donut, Inc., a profitable franchisee since 1988, and owned by Mr. Jollymore’s wife, Anne Jollymore. They alleged that the average price of a doughnut increased from 7¢ when made from scratch to 18¢ to 20¢ under “Always Fresh,” and that this has unfairly cut into their profits. They claimed Tim Hortons makes “enormous profits” on the sale of the “par baked” doughnuts at franchisees’ expense, and that this violates their implied guarantee that ingredients would be sold to them at lower than market price. They also claimed that the lunch menu of soups and sandwiches must be sold at “break-even prices or at a loss,” even though franchisees pay a percentage of sales to Tim Hortons for rent, royalties and advertising. They alleged this is in violation of their franchise contracts, as well as the duty of good faith and fair dealing. They also alleged Tim Hortons committed the offences of “price maintenance and conspiracy under the Competition Act,” the ruling shows. Counsel for the plaintiffs declined to comment Monday. The company said the “Always Fresh” doughnut is not more expensive on average, and denied the lunch items are sold at a loss. It also noted that sandwiches and soups are a crucial part of keeping competitive with other fast-food chains. In siding with Tim Hortons and tossing out the lawsuit, the judge observed that if “par baking” had not been introduced, the cost of baking from scratch would have increased to something like 30¢ per doughnut today. The Always Fresh Conversion was “a rational business decision made by Tim Hortons for valid economic and strategic reasons,” the judge found. “The plaintiffs’ real complaint about the Always Fresh Conversion, buried under boxes of financial statements, statistics, affidavits, expert opinions and transcripts, and expressed with eloquent and passionate advocacy by their counsel, is that they don’t get a bigger share of the doughnut profits. Their real complaint about the Lunch Menu is exactly the same,” judge wrote. The plaintiffs may still appeal the ruling.